Second gaon of Pumbedita. When the Jewish scholars were compelled to leave the Babylonian academies, Mari, with others, went to Firuz-Shabur and there established a new academy which became associated with his name. After the death of the gaon Ḥanan of Isḳiya, in 609, he was elected successor in the gaonate. Two halakic decisions of his have been preserved—one, quoted by Judah Gaon, concerning two unknown plants mentioned in the Talmud (Chaim M. Horowitz, "Halachische Schriften der Geonim," ii. 56, Frankfort-on-the-Main, 1851; "Teshubot ha-Geonim," p. 45, ed. 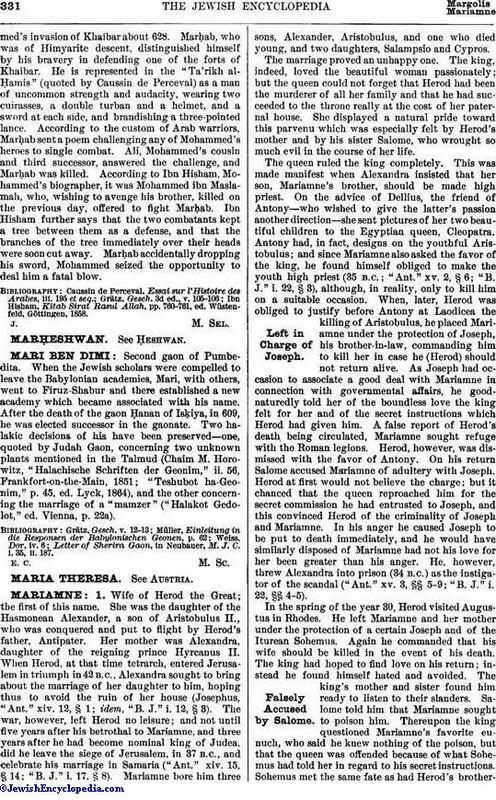 Lyck, 1864), and the other concerning the marriage of a "mamzer" ("Halakot Gedolot," ed. Vienna, p. 22a). Letter of Sherira Gaon, in Neubauer, M. J. C. i. 35, ii. 187.